HI 8711 allows the selection of two set points with two independent outputs for acid and alkaline dosages. Each model accepts either a direct input from a pH or ORP electrode or from a transmitter through 4-20 mA input. The instrument also provides ±5V power output and input terminals for amplified electrodes. In addition, you can choose the output configuration for connecting a recorder or a PLC, between 0-20 or 4-20 mA. 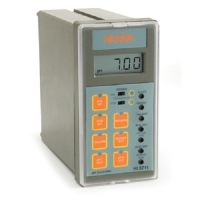 The HI 8711 incorporates adjustable overtime dosing protection from 5 to 60 minutes. If dosing exceeds selected time, the alarm will be triggered and the dosing contact will deactivate. This feature can be activated or deactivated. The HI 8711 is supplied withmounting brackets and instructions.